Why am I doing this? Why start a company, take responsibility for other people's jobs and pay and investors' money, design a product that has no guarantee of success, risk failure? Why not go back to bedside nursing, collect a steady paycheck, and be done with my work when I go home? Read more about Why am I doing this? Let's stop eating our young! People are amazed when I tell them that -- despite nursing's aura of high tech -- for on-the-job data tracking, nurses rely on a mere piece of paper. They call this piece of paper their "brain". Each nurse invents her own format (see examples in our brain museum). Sharing of best practices is rare. Time and information management techniques are not taught nor even mentioned in nursing schools. Read more about Let's stop eating our young! Read more about Use a checklist? Me? In my previous care er I was a computer programmer. 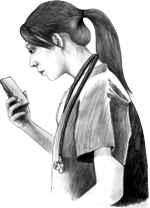 As an RN, I returned to that technology for help with information-related tasks of nursing. Nurses must carry so many details in their heads as they do their work. This makes it more stressful and error-prone than it needs to be. Why not get some help from technology? Read more about What's hard about nursing? This notion of the value of lists is not mine alone. Recently, the New York Times and others have praised A Basic Hospital To-Do List [that] Saves Lives. A doctor at Johns Hopkins is revolutionizing the quality of care and vastly reducing errors by the simple introduction of checklists.